Daar waar Thorbjørn Risager, mooi in maatpak, vandaan komt is het klimaat doorgaans kouder, maar vanaf het ogenblik dat de langbenige bluesman uit Kopenhagen zijn eerste song aanheft, verspreidt de warmte zich als roodgloeiend vuur. Een pracht strot ala Billy Price, die soult Funkt, Bluesed alsof zijn leven er van af hangt. Daarnaast ook nog eens een uitstekende gitarist, die menig mooi loopje etaleert in de diverse songs. Ja U hoort het al, ik ben echt een fan van hem, en Live is deze man met uitmuntende band niet te versmaden, dus dat wordt een groot feest denk ik. Risagers Blues ist extrem ‘schwarz’, mit viel R&B, Soul und Chicago Blues. Sein Gitarrenton ist als eher klassisch-konservativ zu bezeichnen, die Vocals sind rauchig und voll intensiver Emotionen. Track Record Review from Gaffa. 4/6 stars. He was amazing on his debut CD and now, with every new record he gets even better. Thorbjorn is a full package – his voice is memorable and full of soul, his guitar playing brings to mind some of the six string masters and his songs are all potential radio hits. Plus, T.’s band is tight as hell. This new live album is no exception – with the very first song it blew me away as this is the kind of rhythm’n’blues I love to hear. The sound quality is pristine, too. With “Live At Victoria” Thorbjorn is on his way to a worldwide success! Risager is here in top form, full of energy, an energy with a good self-control, organised and musical. Congratulations for the compositions, excellents. A wonderful CD on my opinion. Århus Stiftstidende give 4 stars and writes: “Det er en ren fornøjelse at følge med sangeren, guitaristen og sangskriveren med ud på en sej og svedig tur, der går veloplagt og glad over klassisk rhythm’n’blues, funkede grooves og stemningsfuld 1970er soul”. Sometimes a singer’s voice just stands out and forces you to listen Take one part Ray Charles, one part Bob Seger and one part Joe Cocker and you may have the vocal instrument of Denmark’s Thorbjorn Risager. His “From The Heart” is as auspicious a debut as one could hope for. Actually the band did drop a 2005 live CD but this record is ripe for international applause. A crunchy guitar riff introduces “Love Turned Cold”, a John Lennon-esque rocker, with Risager bellowing from the back of his throat plus a crisp production by Billy Cross. It’s one of three surefire hits on the record. Track three is the smoldering midtempo Soul/Blues “Burning Up” augmented by Kasper Wagner’s sax and Andreas Biilmann’s trumpet and a catchy guitar hook while track 6 “Heart Of The Night” is a stunning Soul ballad- the kind Ray Charles Used to deliver. Fantastic. All three were written by Risager in addition to the Blues shuffle “You Can Have It Your Way”, the slow blues “Ain’t Gonna Turn My Back On You” and a few others. The band lays down a couple cover tunes for good measure including the classic jump blues “Roll ‘Em Pete” (piano by Emil Balsgaard) and Don Nix’ “Same Old Blues”. Ten tracks without a dud in the bunch, “From The Heart” is sizzling with Soul. 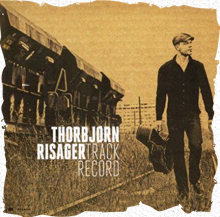 Even though we have put the spotlights on several Scandinavian bands, the name Thorbjörn Risager was totally unknown to me. According to the enclosed press release he should belong to one of the best vocalists in his home country Denmark, with his strong soulful voice. And yes.. we could certainly believe that after listening to this production with 75 % original compositions. The man is really in possession of a powerful, slightly raucous voice which is letting his songs sizzle. On top of this, the present horns could put a solid feather in their hats. Their solid creativity and intensity are providing the candles on this mainly soulflavoured bluescake. But also the well placed and well portioned guitar solos, sometimes reminding quite a bit of Stevie Ray Vaughan, by a certain Svein Erik Martinsen is also adding a nice flavour. Add the impressive production by Billy Cross and you have a brilliantly put together product. It is also difficult, then, to point out peaks, since this record is glowing from beginning to end. And admitted, this is presently rather an exception than a rule. But yes… it’s really coming “From The Heart”! 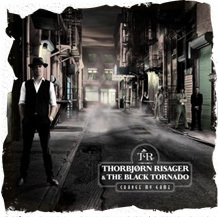 “The charismatic Thorbjörn Risager holds the reputation of the best Danish vocalists who’s got a voice full of blues and spiritual soul. 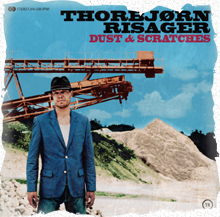 The essence of today’s Danish blues is Thorbjörn Risager with his band, sounding great in those swaying New Orleans sounds and in straight ahead rhythm’n’blues. SUCH a band would be a major attraction on many Polish blues festivals! Thorbjørn has a strong gravelly voice with no hint of an accent and his song writing skills are good with a good understanding of the main style the band operate in. The seven-piece line-up means there is a big full sound. The rhythm section is spot on and solid and all the band members get to step up at some stage. Most of the numbers are short and to the point so there’s no epic soloing, just good tasty breaks when needed. All round a good one, I liked this album a lot. This band is worth investigating and British promoters take note! Singer and guitarist Thorbjorn hails from Denmark where he fronts the group ‘Blue 7’, favourites of the Copenhagen blues scene apparently and purveying the sounds of fifties and sixties New Orleans r&b. There is not much of the Crescent City to be heard on this CD (Thorbjorn and the band’s second) but he is a talented singer with a big, rather gruff but surprosingly flexible voice, demonstrating here influences (on vocals and stylistically) from the likes of Big Joe Turner, Robert Cray and Freddie and B.B. King, whilst the opener broadens the range a little by crashing in like ZZ Top and the closer is low-down in a Kim Wilson vein. Some very good original compositions and a fine band make this another very listenable set from mainland Europe. Phenomenal. Supreme and sensual output from the Danish blues-depth. It doesn’t sound a bit Danish, and it brings reminders of the old band Chicago and the blues shouters before them. A roaring dark and raw voice, that carries through, a big orchestra sound, an almost incredible precision in the interplay’s smallest details. And it swings like hell! It’s especially the voice that makes Risager into something special. He’s raw and rusty as a downpipe, and hearing him could even remind you of Joe Cocker himself. And the music is actually also in the same area, which is rock and bluesrock of the melodic and very energetic kind. Even if Risager defines himself as a rhythm & blues singer, there’s also plenty of rock & roll in the songs. It’s understandable that Thorbjørn Risager’s voice has been called one of Denmark’s best, when you hear how it is developing on his second CD. There is really some depth and power hidden in it, when he brings out his songs, which range from the classical bluesy to soulful r’n’b.— The sound is pleasantly warm, which suits last year’s Danish blues artist brilliantly. What can the listener expect? Well, first of all a breath-taking voice. Risager is in possession of a “killer voice” and he knows how to use it, especially in the up-tempo songs, but thanks to its enormous range it’s also absolutely convincing in the soul-oriented numbers. Risager’s organ is distinguished through power, volume, expression and perfect intonation – his voice is more than just getting attention, it’s dominating the whole album. So far, so good, yes even excellent. Rooted in 50’s and 60’s R’n’B, with a strong shot of New Orleans and soul, this group, which also includes two horns, develops enormous pressure. Risager’s strong, absolutely accent-free voice is powerfully moving somewhere between Delbert McClinton und David Clayton-Thomas (now and then, the horn section is also bringing reminders of Blood, Sweat & Tears) and is influencing the sound deeply. An unbelivably nice organ! Risager is furthermore proving to be a competent guitarist, and above all an excellent songwriter. The group is also displaying its fine swingfeeling more than once. But here again, the impressive vocal chords of the bandleader are in the center of attention. Don’t miss this!